Grignan is a hillside fortified village clustered tightly around a large Renaissance castle that dominated the top of the hill. Grignan was made famous in France by the Aristocratic Madame de Sévigné, remembered for the many letters she wrote in the 17th century.  Market day Tue. 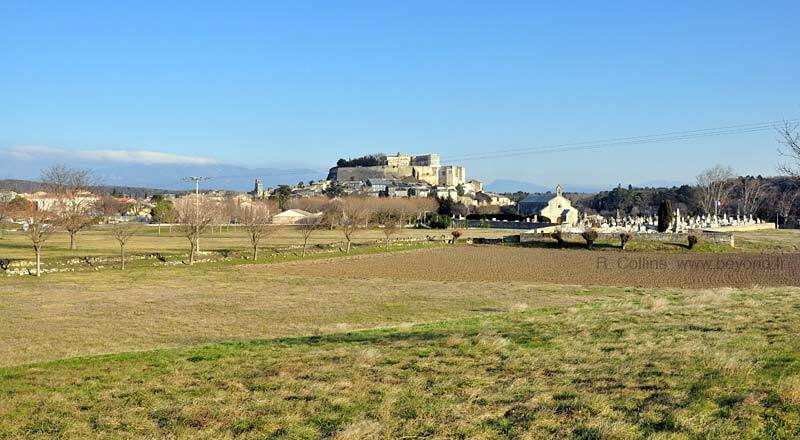 The hilltop location of Grignan is very low, but prominent because is sits on a an expanse of flat farmland, about 20 km east of the Rhône river. The original Château de Grignan dates to the 11th century, with local documentation in 1035 mentioning the Rostaing du château de Grignan. Christophe de Grignan was established here at least by the year 1030. The Grignan family became well established for the next century, but in 1239, ownership of Grignan passed to the Adhémar de Monteil family, and expansion of the castle began then, first becoming a mighty fortress. From this time the Adhémars rose in influence and power, from Barons to Dukes to Counts, and the castle grew correspondingly. In 1559, Count Louis Adhémar died without an heir; his titles and possessions passed to his nephew, Gaspard de Castellane. The castle was eventually inherited by François de Castellane-Ornano-Adhémar de Monteil de Grignan. The 16th-century Medieval castle was remodeled from 1545 to 1558 by Louis Adhémar. A century later, from 1668 to 1690, François de Castellane-Adhémar converted it from a fortress to a magnificent Renaissance palace. The Château de Grignan was completely ruined in 1793, during the French Revolution. Early in the 20th century, Madame Fontaine spent her entire fortune restoring the castle to its former grandeur. The castle today is owned by the Departement of the Drôme. The 16th-century Collégiale de Grignan sits at the base of the Chateau, on the east side [Photo-09]. The church was built from 1535-1539 by the Baron Louis-Adhémar. The Renaissance facade was sacked during the Wars of Religion, and rebuilt in 1654 by Count Louis Adhémar. Inside is the tomb of Madame de Sévigné, who died in Grignan in 1696. 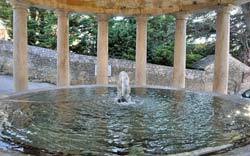 Grignan's Lavoir du Mail is a 19th-century lavoir (wash house) with a circular basin inside 16 Doric columns. The site was nicely shaded in the time of Madame de Sévigné. The lavoir is named after the game of mail that was popular then: a game using a wooden ball and a mallet, similar to croquet (but without the hoops). Today the site is used for the local market, and the current game is pétanque. 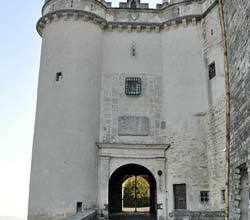 The ramparts of Grignan were built in the 13th century. The circular protective wall included a dozen defensive towers and six entries (portes): porte du Tricot, porte St Jean, porte de Costefroide, porte de la Glacière, porte de la Grande Tour and porte de Costechaude. The tall, square tower (tour carrée) was built at the porte du Tricot as an alarm tower. The dome was added later, along with the village's first clock. An amazing Miniature Provencal Village of santons is located just outside Grignan, 1 km southeast on the D541 road. 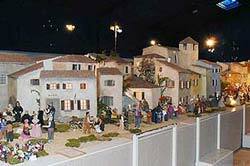 Open all year, the Village Provençal Miniature of Grignan has a 1/6-scale santons layout of 400 square meters, with 70 buildings and at least 1000 santons characters, including people and animals. Every winter, creche themed santons are invited from around the world and placed amidst the Provencal Village santons. This photo gallery display is from 2015-2016 with creche santons from Africa and South America. First record, 1035 Castellum Gradignanum; 1105 castrum Grainan; Graigna; Grazinam, and so on. Prehistoric: Grignan's hill was occupied in the Iron Age, and there is evidence of a Bronze Age society here. Gallo-Roman: The Romans occupied Grignan in the 5th and 6th centuries AD. Medieval: Ruled by the Grignans, then the Adhémars (following the history of the castle, see above).